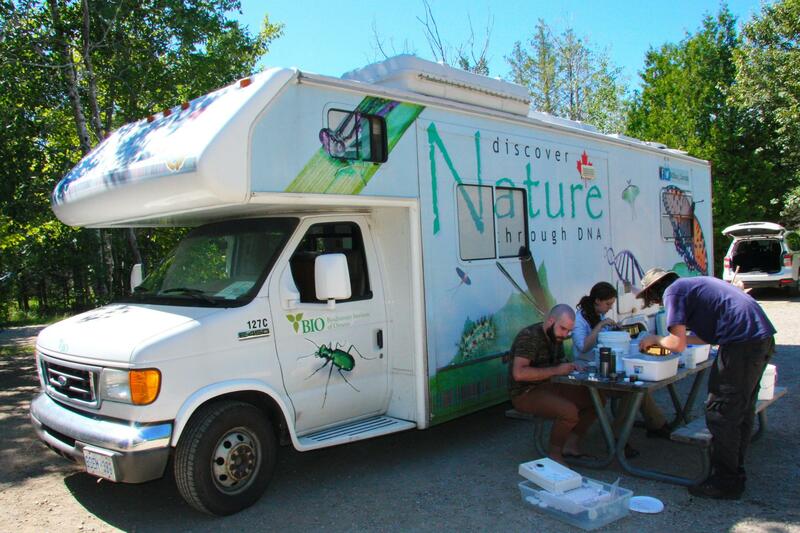 After a successful week of sampling at Long Point Provincial Park, the BIObus was off to Bruce Peninsula National Park. The Bruce Peninsula divides Georgian Bay from the main basin of Lake Huron, and has some very unique aquatic ecosystems where interesting species can be found. We sampled a variety of these habitats which included creeks, marshes, ponds and lakes. Connor (left), Nate (middle, and Shannon (right) hand collecting water beetles. 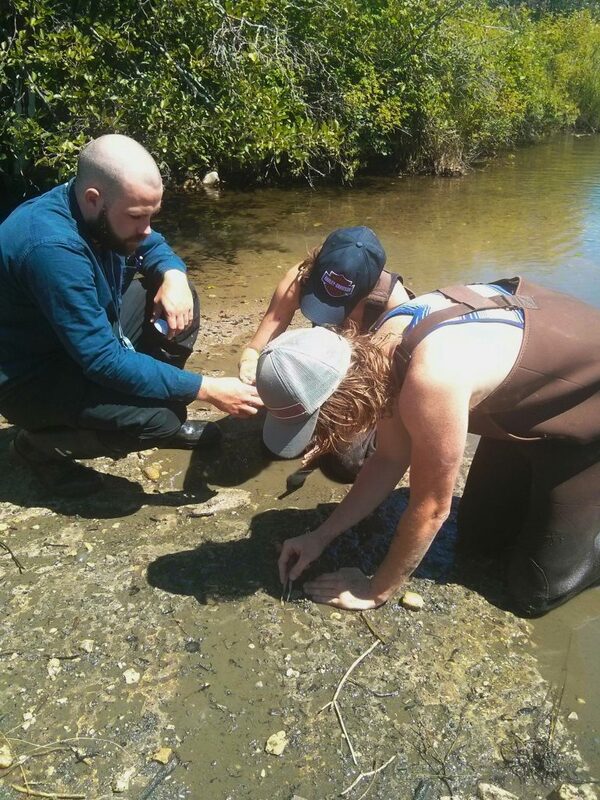 Connor (left), Shannon (middle), and Nate (right) hand collecting water beetles. 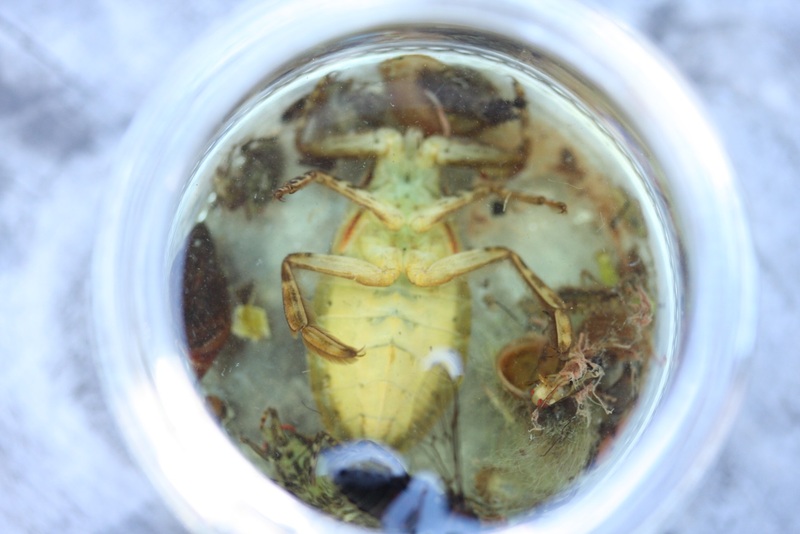 Of the sites we sampled, the marshes consistently held a high diversity and numbers of aquatic invertebrates. With a few swoops with the D-net along submerged vegetation and roots in a beaver marsh we collected several giant electric light bugs (some of which were almost 2 inches long) and many other interesting aquatic insects. Connor (left), Shannon (middle) and Nate (right) sorting the specimens to size. 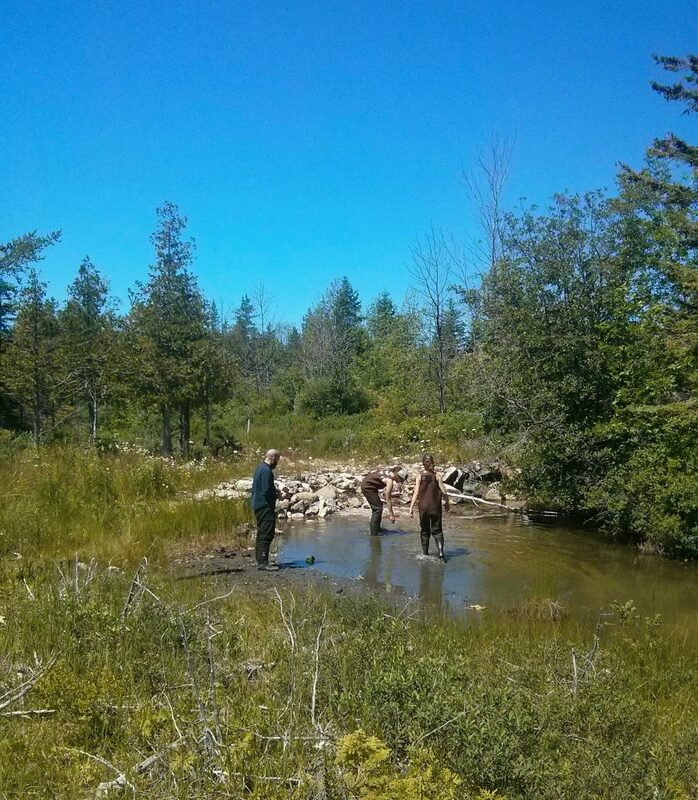 Collecting worms in the Bruce Peninsula National Park was more challenging than anticipated in some areas. 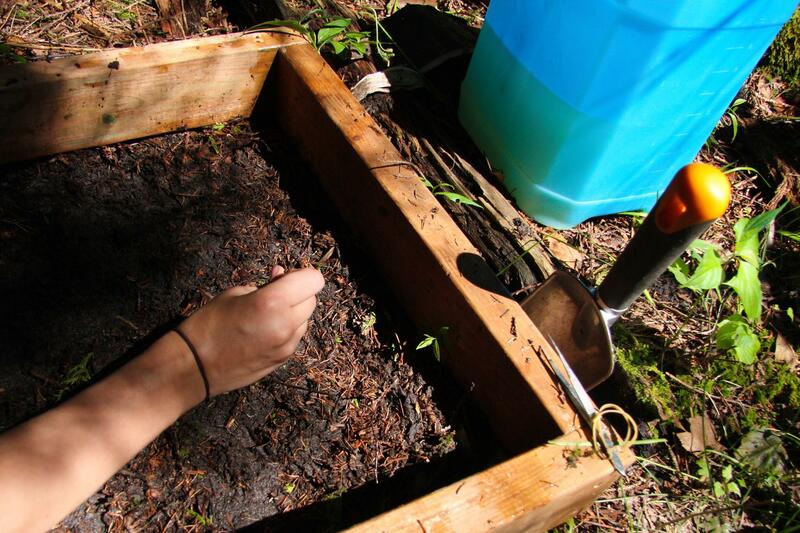 Loamy soils were sparse across the region, the soil composition was primarily dominated by conifer litter and often a thin layer on top of bedrock which is not ideal worm habitat. 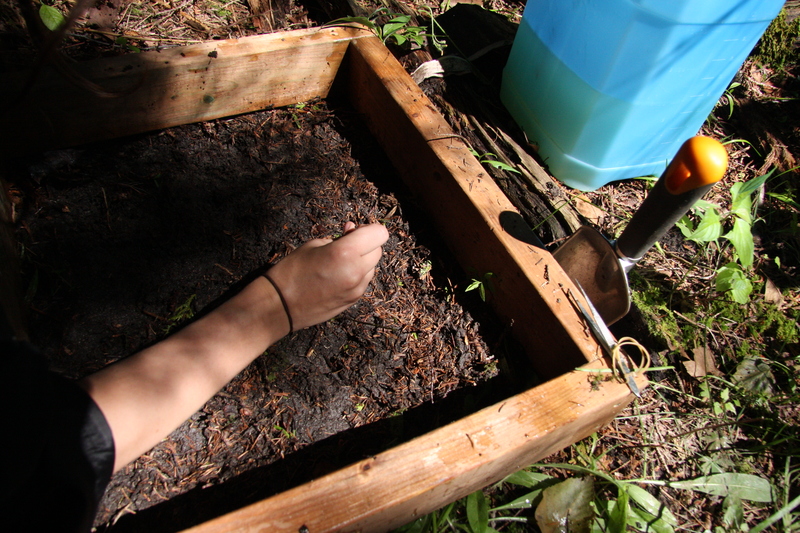 Shannon gathering the emerging worms from the Black Creek Provincial Park sampling site. 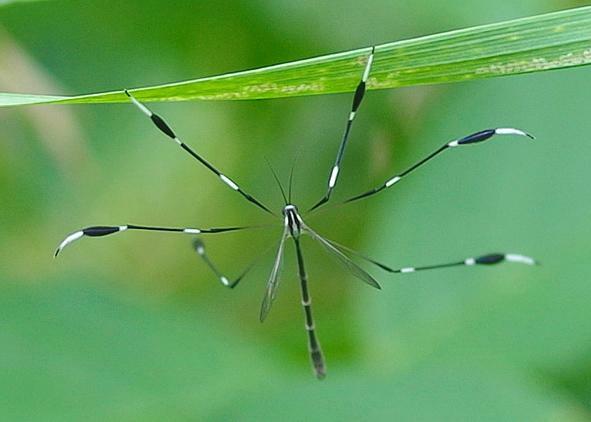 One of the most memorable experiences from this sampling trip was my first encounter with the elusive phantom crane fly (Family: Ptychopteridae). The flight pattern of this fly makes it appear like a floating seed along, however, the most interesting aspect was how its black and white striped legs and body made it very difficult to track and catch in the light-speckled thickets which these flies inhabit. I was amazed by the illusion of the phantom crane fly disappearing and reappearing from plain sight in the long grass. As part of this summer’s ongoing BIObus adventures Adrian, Connor, Nate and I got the chance to go hunting for arthropods in the beautiful Bruce Peninsula last week. With the weather being more than welcoming, we eagerly strapped on our waders and set out to explore the diverse aquatic habitats of the Grey-Bruce region. One thing I couldn’t help but notice during our daily sampling sessions was the abundance of belostomatids in almost every area we were. If you are unfamiliar with the term belostomatid (family: Belostomatidae) , it refers to a family of hemipterans often known by their common name “giant water bugs”, “electric light bugs” or “toe-biters”. Having grown up in and around the wetlands of Ontario’s lake country I was a little surprised to realize that I had never before encountered one in the wild. From left to right: Nate, Adrian and I getting ready to start the day’s sampling. Despite their vaguely alien appearance and their formidable sounding nickname, their main prey is in fact not human toes. Being extremely sneaky ambush predators, belostomatids normally disguise themselves as part of the surrounding plant life in order to sneak up on other invertebrates, small fish, crustaceans, snails, amphibians and – yes – the odd stray toe. Some belostomatids are known to reach sizes that can exceed 12 cm (that’s slightly less than the size of our 10 dollar bill!). Luckily for us Canadians they don’t get quite as large as that outside of tropical, subtropical and temperate areas. Unrelated to their size or behaviour however, belostomatids have some definitely interesting physical characteristics. 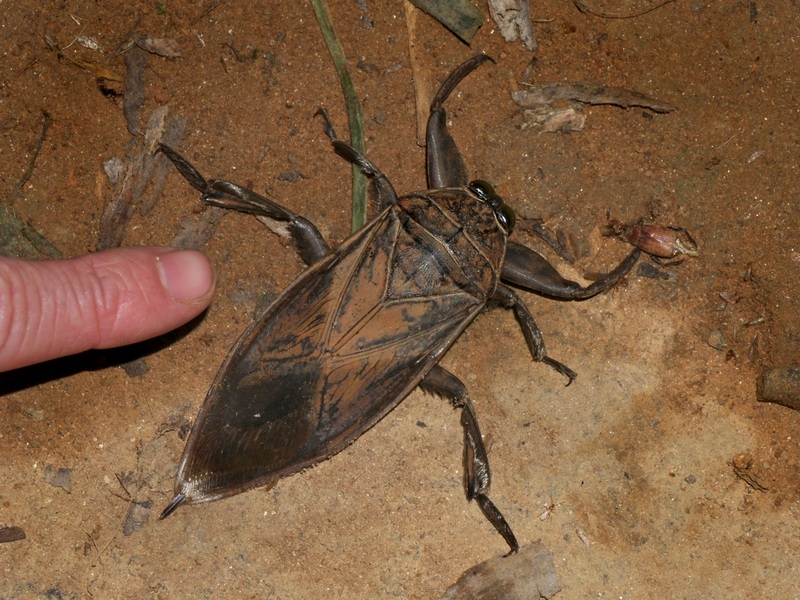 Giant water bug (Belostomatidae), Vohimana reserve, Madagascar by Frank Vassen. Some rights reserved. Check out those huge raptorial forelimbs! Like many air breathing aquatic insects, belostomatids have evolved a special kind of breathing strategy to deal with their mostly underwater lifestyle. Spotted along their body is a collection of small openings called spiracles. These spiracles open into tunnels known as tracheae that are responsible for delivering oxygen from the air directly into their tissues. The question I’m sure you’re asking yourself is: ‘but how do they breathe air if they hunt underwater’? The answer to that is pretty fascinating in my opinion. Before they dive underwater belostomatids take in air through two spiracles located on their rear end. These rear spiracles adjoin to other spiracles that line the underside of their wings. When air is drawn in through the rear, small pockets of air become trapped under their wings. These trapped air bubbles then act as a kind of SCUBA tank while the belostomatid searches for its next meal. Here’s a photo of one of the belostomatids caught during our sampling. As you can see it’s not quite as big as the giant water bug from Madagascar, but it still dwarfs the fly in the lower right corner! Another interesting feature seen in most belostomatids is their unusual take on parenting. Once females lay their eggs, the male is tasked with providing an extended day care service. It seems like that would be a simple enough thing to do but, unfortunately for the male, it isn’t the easiest charge. This is because the female will lay the eggs directly onto the male’s back essentially giving him a giant, fragile backpack. The male must then protect the eggs, keeping them oxygenated, clean and moist until they eventually hatch 1-2 weeks later. If they aren’t careful, males could run into other nymphicidal females looking for a convenient mate to raise their own young! Anyway, to hear more about our Bruce trip or to keep up on other cool arthropod facts, be sure to read Nate and Adrian’s blogs this week!